It has been so long since I've updated. Look, I'm not an interesting person, and I hate to talk much about myself, even on my own blog, but I think I should explain. This won't be one of those "Oh, I promise I'll keep writing, because I love this so much" things that goes up and ends up being one of the last few posts someone ever writes; on the contrary, I do love this blog, but I anticipate that there are going to continue to be intermittent interruptions in my posting schedule, and anyone who cares to keep reading in spite of that has my sincere gratitude. My grad school career is, I certainly hope, coming to an end this year, one way or another, and that means one more big life change: going on the job market. In an economy like the present one, this process may feel like playing musical chairs with about half as many chairs as there are players. Yipes! That's where I've been. 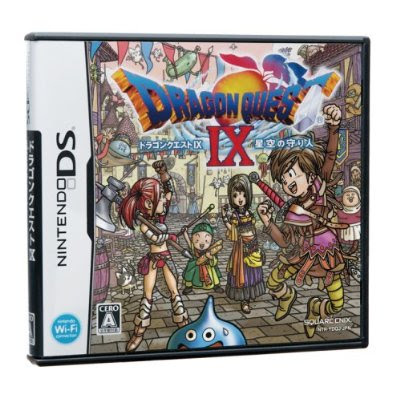 I have been up to one big gaming thing lately: I've been trying to play Dragon Quest IX. The problem is that I do not speak or read Japanese. Not at all. I know both sets of kana blah blah, but really, my Japanese is nonexistent. I am not lacking in groundless confidence, though, and so I've thrown myself at the game in the hopes that the language will start clicking somewhere along the way. This is sometimes how language acquisition works, believe it or not. If you have any experience with this sort of thing, you're probably thinking yeah, so how's that turning out? And you're right. It's not turning out so well so far. On my first attempt, I tried to use an online dictionary, which ended up being a decent idea except that it's impractical; a lot of the point of a DS game is enjoying it, you know, in contexts where you might not have access to the internet. I guess places like that are becoming fewer and fewer, but I don't really own a portable internet-capable device that will work on the bus or anything, so that's not such a good option. On my second attempt, I tried just playing through, saying screw it, forget the language. That defeats a lot of the fun for me; I still do want to learn Japanese, and while DQIX is, so they tell me, a job class-type game with lots of interesting mechanics, the early game requires actions of the player that aren't immediately obvious without text and context. It can be done, but it isn't fun for me; plus, what's going on while I'm skipping the text looks intriguing, and I really do want to follow along. So here goes attempt number three. I have a good kanji dictionary already, but I don't want to count strokes, and DQIX has all the furigana your heart could desire, so I thought it made sense to get a phonetic Japanese dictionary, and that's what I did. The early verdict? My God, they're playing my song. It's like sitting down with a Latin dictionary and Cicero or Virgil, only this time it's for me, not my professor, and I'm playing a goddamn video game. I like this. Wish me luck!